Becca Fletcher is the original party girl who does not want to be tied down by or rely upon a man. Something that happened to her as a teenager has led her to hate Christmas and anything relating to it, so she is not looking forward to spending her Christmas with her sister, Laura, and her two children in Dorset. Whilst there she meets the charming Irish surfer Sam, who likes to appreciate women. There are immediate sparks between the two, but will Becca allow it to go further than a little fling? Will Christmas grow on her and does the warmth of the Comfort Food Café and the people who eat and drink there make a difference in her perception of the holiday? Christmas at the Comfort Food Café flashes back to what happened to Becca when she was younger. It reveals what has led her to hate Christmas and not want a relationship with others. It also demonstrates how she is caring and puts her sister and her family first by the catalyst for her change in attitude towards alcohol, cigarettes and one night stands. I found myself worried that she may fall off the wagon and wanted her to open up to her sister and tell her all about her past and then to be wrapped in great big hug, which is exactly what the healing quality of the Comfort Food Café and its customers is like. Some of the characters from the first book, Summer at the Comfort Food Café, make another appearance. I loved reading about the continued new relationship for Laura, which led to the family staying in Dorset after only going there for the summer to try to build some confidence after the death of her childhood sweetheart and husband. The story shows how the children have changed and how the café got hold of them all. Of course you also have the spectacular wedding of the café owner, Cherie, and one of her long term customers, and farmer, Frank which of course may not go as planned! The characters, as always in Debbie Johnson's books, are colourful and fantastically described, so that you feel like they are your friends. Also, the food sounded amazing and I like the fact that some recipes are included at the back of the book. Debbie Johnson will have you laughing out loud with the characters and at the same time feeling for them and the situations that they find themselves in. If this is the first book by Debbie Johnson you read it certainly won’t be the last. This is the second book set at the Comfort Food Café in Dorset and is a great follow up to Summer at The Comfort Food Café, although can still easily be read as a standalone. 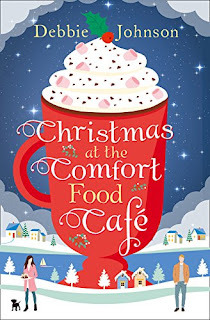 One very lucky reader of With Love for Books will receive a paperback copy of Christmas at the Comfort Food Café. I love the idea of recipes with the book. Looking forward to reading a book about a person who doesn't like Christmas. Knowing things will change by the end. It sounds like a great book. I would love to read it. Thank you for a wonderful book. Nothing better than enjoying a great book. The cover is absolutely gorgeous. I love your book cover ... it draws me in and makes me want to read it !! The book sounds like my type of book. Thanks for the chance. This looks a perfect book to read in the cold Winter months - your review makes me want to read it! Oh this sounds so good and a perfect read for the holidays! I cannot wait to read and see what happens between Becca and surfer Sam!! This looks a lovely book for reading in the Christmas holidays. I love reading these topics when holidays are approaching. All her books have lovely covers! I want to read them all! Christmas at the Comfort Food Café by Debbie Johnson. Your review of this book was great and i like the book cover. Last year I read Christmas at the cupcake cafe to get me in the festive spirit at that was fab ! Sounds like a great read, thanks for the chance to win! Ohh, I had no idea your blog has a new blogger reviewer! That's great how you expanded you little family! ;) Welcome Tanya!